In today’s News & Notes, Evgeni Malkin has been suspended one game, the Anaheim Ducks have placed John Gibson and Chad Johnson on the injured reserve, Michael Chaput has been assigned to the AHL and Karson Kuhlman has been recalled from the AHL. The NHL has suspended Malkin for one game for his high-stick on Philadelphia Flyers’ forward Michael Raffl. Though the stick may not have made solid contact with Raffl’s head, the NHL has suspended Malkin for the intent according to Rule 60.4. By this standard, the match penalty to Malkin makes sense. It’s natural for a player to be upset when another player hits them in the back of the head the way Raffl did to Malkin. 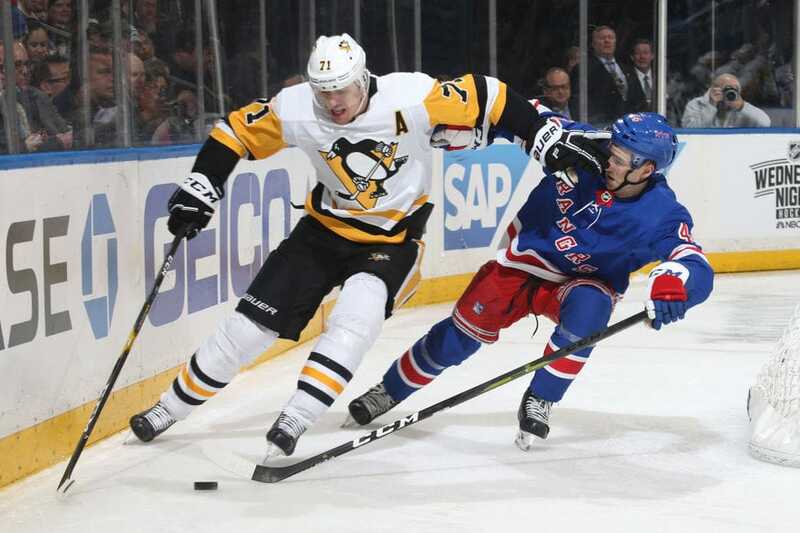 That said, swinging a stick in that manner should never be permitted and the NHL could have easily given Malkin a much more significant suspension than the one they did. In 51 games this season, the 32-year-old Malkin has scored 14 goals and 56 points. 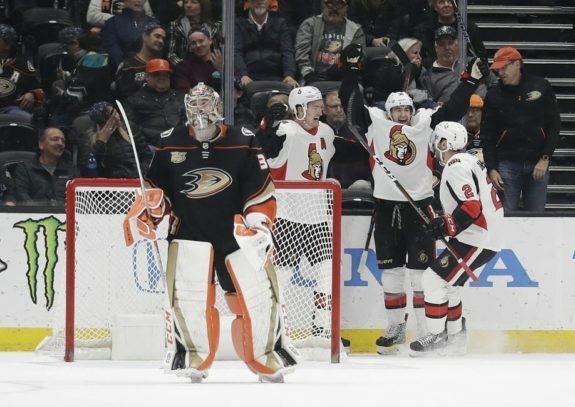 The Ducks’ goaltending ranks got a little thinner Wednesday when general manager Bob Murray announced that both Gibson and Johnson were placed on the injured reserve. As a result, Kevin Boyle and Ryan Miller are set to be the team’s starter and backup Wednesday when the Ducks take on the Vancouver Canucks. One of the lone bright spots on the Ducks this season, Gibson being placed on the injured reserve is a big loss for the Ducks. The 25-year-old’s peripherals don’t tell the whole story as his 2.93 goals-against average and .914 save percentage don’t seem very impressive on paper. In reality, however, Gibson is playing behind a team that has struggled across the board. His performance has been admirable, to say the least. In nine games with the Ducks this season, Johnson has gone 0-5-0 with a 3.75 goals-against average and a .872 save percentage. He hasn’t had any more success in Anaheim compared to his time in St. Louis earlier this season when he’d go 2-6-0 with a 2.55 goals-against average and .884 save percentage. The Montreal Canadiens have assigned Chaput to the Laval Rocket of the AHL. The 26-year-old spent 32 games in Montreal this season and has recorded five assists and a 50.5% faceoff win percentage in primarily a fourth-line role. Canadiens assign forward Michael Chaput to the AHL’s Laval Rocket. This move is likely a response to the Canadiens acquiring Nate Thompson from the Los Angeles Kings just two days prior. The Canadiens placed Chaput on waivers Tuesday before he cleared Wednesday, allowing them to assign him to Laval. In 167 career NHL games, Chaput has scored six goals and 22 points. He’s already played 18 games this season in the AHL and has scored seven goals and 10 points. the Boston Bruins have recalled Kuhlman from the AHL. The 23-year-old is in his first professional season with the Bruins and has scored 12 goals and 25 points in 50 games thus far. This is his first stint with the NHL club in his career. Kuhlman brings everything a team could ask for in a modern-day bottom-six player, including speed, skill and solid awareness in all three zones. He would serve as the captain of Minnesota-Duluth in his senior year in 2017-18 and brings a distinct leadership quality to the Bruins despite having never played in an NHL game before. In 44 games in his senior season as captain, Kuhlman would score a career-high 13 goals in 44 games. He has the ability to play both down the middle and on the wing and will fill a depth role for the team while David Pastrnak recovers from his thumb injury.